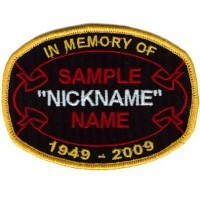 This is the Memory Ribbon Oval patch. You have a ton of options with this patch, so choose carefully. You will have 3 letter colors to choose. The top IN MEMORY OF line and the bottom DATES line are 1 color choice. The ROADNAME/MIDDLENAME/NICKNAME are another color choice. The FIRST/LAST name is another color choice. 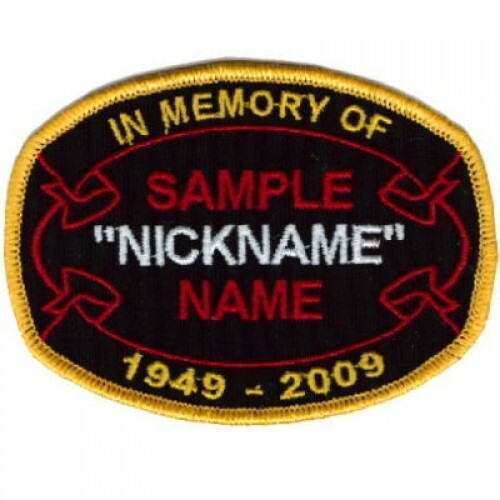 The Ribbons that wrap around the inside of the patch are another color choice. The rest of the choices are obvious. The text: "IN MEMORY OF" on the top line is default. If you MUST change the lettering you can, but you will need to order, then call us with the change.